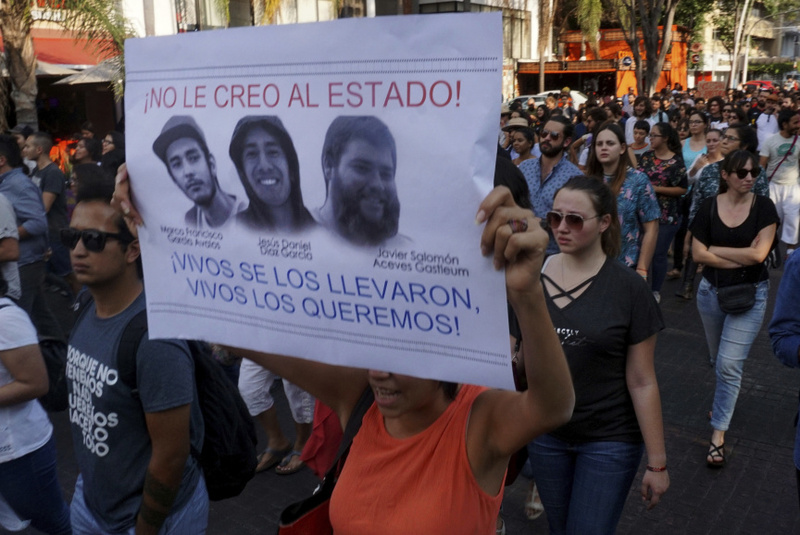 MEXICO CITY (AP) — Three vanished film students whose case had become emblematic of Mexico's 30,000 missing people were killed after being caught unaware in the midst of a drug gang turf battle, officials say. Prosecutors in the western state of Jalisco said late Monday the three were abducted by the Jalisco New Generation Cartel because they were filming a school project at a house used by the rival Nueva Plaza gang. The students were using the residence on the outskirts of the city of Guadalajara because it belonged to one of their aunts. "Without knowing it, the students were in a very dangerous place which was being watched by hit men from the New Generation cartel," the prosecutor's office said. The aunt was implicated in a human trafficking case involving prostitution at massage parlors in the city of Guadalajara. The students' fate horrified Mexico: Prosecutors said they were killed and their bodies dissolved in acid. "Words can't describe the dimension of this madness," Oscar-winning Mexican director Guillermo del Toro wrote on Twitter. "Three students are killed and dissolved in acid. The 'why' is unthinkable, the 'how' is terrifying." The killing appeared to be a case of mistaken identity. Prosecutors said the New Generation cartel lookouts who were watching the house mistook the students for rival gang members and abducted them on a road after they left the house. Prosecutors said the gang took the students to a safe house and interrogated them. The gang beat one student so badly he died, leading them to kill the other two, officials said. They then took them to another house, where prosecutors found jugs and tubs of sulfuric acid. Traces of blood and the DNA of two of the students were found at the houses. Two suspects have been arrested and several others are being sought. Officials close to the investigation said one of the suspects arrested is a local rapper who has some following on social media. Investigators also found fake detectives' credentials at the houses, and prosecutors said the killers apparently posed as detectives when they pulled the students over. One gang leader had already been arrested at the aunt's house in 2015 and police had received reports of armed men hanging out at the property in 2017. "The effects of crime and violence against any person is bad enough, but it is worse when it is a case of young people who have a future, who are studying, who are working for Mexico," said Luis Gonzalez Perez, president of the country's National Human Rights Commission.